Why do we have a brand? When you say "brand," most immediately think about logos or an identity system. But a brand of an organization is much more - it's an entire structure, the images, primary messaging, and way of thinking for any organization. A brand is about reputation, and the UNOH brand reflects that reputation. Do we give students a unique experience? Our publications reflect that. Do we have faculty who have years of experience in their fields? Our website reflects that. Do we have a university that is known worldwide to be at the forefront of Applied Technologies degrees? Everything we say and do reflects that. Why do we have brand standards? UNOH has continued to update our identity brand standards to ensure a consistent "look" and style for references in the marketplace. Consistency among all segments of the University of Northwestern Ohio ensures a solid brand and solidifies name recognition, a fundamental element of institutional positioning. We strive to uphold this brand, or image perception of UNOH, and continually inform and engage our audiences about the advantages of a UNOH education in an increasingly diverse and competitive higher-education marketplace. UNOH's Brand Standards establish official policy and standards for the design and text of University of Northwestern Ohio publications, stationary, signage, and other applications, including the Web. It is important that UNOH project an image of excellence and cohesiveness to all of its many audiences. The Logo and University names have registered trademark protection and any use of the logo or official university names, other than those prescribed within the UNOH Brand Standards Manual is prohibited, regardless of funding sources. 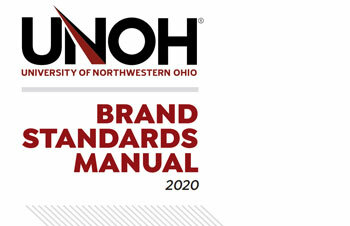 Alterations to the specifications outlined in the manual are prohibited without prior consent from the UNOH Marketing Department and University President. For information and guidance on the use and application of the UNOH brand, download a copy of the UNOH Brand Guidelines Manual.